कोट्स GG might say about Chuck and Blair. WHAT Gossip Girl might say at the end of 2x14, when Chuck is in Chine/Japan (dunno which one), and Blair is waiting for him to return.. Wallpaper and background images in the Blair & Chuck club tagged: gossip girl blair chuck chair ed westwick leighton meester love quotes. 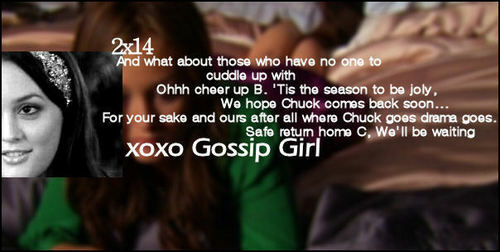 WHAT Gossip Girl might say at the end of 2x14, when Chuck is in Chine/Japan (dunno which one), and Blair is waiting for him to return. This Blair & Chuck fan art contains चित्र, headshot, closeup, हेडशॉट, and क्लोज़अप. There might also be मोबाइल फोनों के लिए, हास्य पुस्तक, मंगा, कार्टून, एनीमे, कॉमिक बुक, and manga.